Pearls are quite delicate and beautiful and should be handled with care. If you take a few steps of precaution, you will extend the life and look of your pearls. I may have gone a little overboard on my zeal for pearls. I can’t help it. I love them. It’s official. They are so beautiful and when you think of how they are made, it makes each individual pearl a little more remarkable. Shall we begin at the beginning? The formation of a natural pearl begins when a foreign substance (like a grain of sand) slips into an oyster between the mantle and the shell. The mantle is what the oyster uses to create its shell so when it gets irritated (go ahead… picture an irritated oyster), it’s kind of like the oyster is getting a splinter. The oyster’s natural reaction is to cover up that irritant to protect itself. The man­tle covers the irritant with layers of the same nacre substance that is used to create the shell. This eventually forms into a pearl. Voila!! Now, with that said, it really takes that oyster quite a bit of work to shellac that irritating grain of sand and add layer upon layer of nacre. That’s why there is a big price difference in the types of pearls you can buy. Oysters aren’t too particular in their general handling when getting rid of their irritation, so when you get a perfectly round pearl, it is special. The larger the pearl, the more the worth is also a good rule when it comes to naturals. I’d like to say bigger isn’t better… but it is in pearls. You’d think that something that grows inside a gooey shelled bivalve wouldn’t need to be handled all that carefully, right? Wrong-o! Pearls can be pretty fussy and delicate but with a little effort on your part, you can keep your pearls looking as pretty as the day the oyster popped it out. You can probably do better considering the pearl was probably a little smelly and slimy at the time. Start by how you store them. 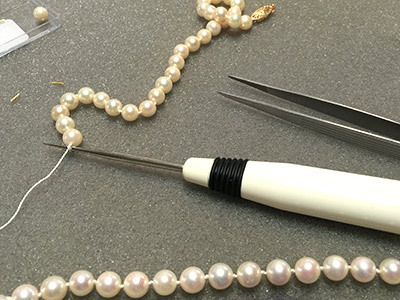 Any jeweler that sells you a nice strand of pearls should provide you with a folder of some sort that has little hanging snaps so you can wrangle your pearl strand into shape and keep it from getting stretched or scratched. Use the folder. The better you are at using it, the nicer your pearls are likely to stay. Didn’t get a folder with your pearls? No problem. You can make due with a nice handkerchief or soft cloth. Lay the pearls out flat and roll gently into the fabric, cocooning your pearls. It’s really all just common sense once you know what you are dealing with. Now for the fun part. Wearing your pearls. Nothing can make a girl feel like a class act better than a beautiful creamy strand of pearls. Trust me. There is something about those cool little orbs that bring to mind Jackie O, Elizabeth Taylor, The Queen of England. Not your style? How about Scarlett Johansson, Angelina Jolie and Katy Perry? Even our First Lady has gotten on board with this classic piece of jewelry. Do your pearls (and all your jewelry, really) a favor? When you start primping with lotions and perfumes, hold off on putting your strand(s) on until you are done. There is alcohol in perfume that can damage the nacre of the pearl. Lotions and soaps can hasten the deterioration of the silk that your pearls are hung on. Can you clean your pearls? Again, yes you can, but carefully. I recommend using warm soapy water. The soap can be a mild dish detergent, (just a squirt will do the trick) and I like using plasticware so as not to abraid the pearls. If you inherit a very old strand that look yellow, you may need to invest in a restringing but gently wash them and check out the results first. If your pearl feel gummy or sticky after washing, they may not be real pearls. To check and see if they are real, bring them in and we can inspect them for you. We can also check and see how that slim piece of silk that holds them all together is doing. Gently rub two of the pearls together. Do they feel gritty and sandy? That is an indicator that they are real. Pearls should not feel slippery or smooth. In the olden days, jewelers would rub a pearl on their teeth to check for the grittiness. Yes. I have done this myself, although it’s not my recommended technique. It works. You can feel the roughness of a natural pearl on your tooth as well as another pearl. Look at the knots in between the pearls. Do they look frayed and fuzzy? If so, this is an indication that a restringing may be in order. Is the silk stretching? Can you move the pearls back and forth on the string? This is another cry for help. Pearls will eventually do all the above, especially older strands. If you think you are going to wear them, taking the time to restring them. It’s not expensive (in the big picture) as compared to replacing the strand if it breaks and gets lost. A quick word about pearls and knots. Hey, that sounds like the name of a good restaurant! I did some research awhile back about why some pearls are knotted and some aren’t. I thought it was an indication of a real strand as long as there were knots in between. For the most part, I was right. Pearls are knotted for several reasons. One is that, if the string breaks, you aren’t chasing your precious little shells all over the place. It safeguards against that. It also keeps the pearls away from one another. Pearls can chip and scratch each other if not knotted. You may not have realized your pearls are knotted because, if done well, the knots are small and uniform. This becomes even more true when you are talking about fine, higher end pearls. I did find, at a high end pearl site, that the women in Japan are starting to prefer their pearls without knots, so I guess it can be as esthetic too. I like the knots. I like knowing that if that string fails, I may lose one or two beads but not the whole enchilada. When in doubt about any of the above, bring it to your favorite jewelers… Design One Jewelers, right?? Questions? Comments? Let me know!